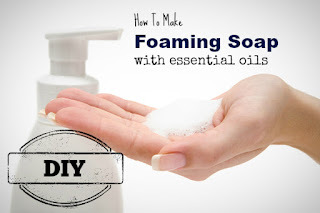 Here is a way to make your own natural foaming soap – and it is EASY! You probably already have all the ingredients, too! You can use any empty foaming hand soap bottle you have laying around the house or you can purchase a new one here . Mix and match your favorite essential oils to create your own custom soap. The options are endless! Add water (slowly) into the bottle making sure to leave room for the pump. Add lid, shake, and you are done! Pump 1-2 times into hands and wash with warm water.